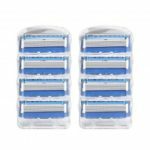 Replace your used razor blade with these 4-blade razor blade refills. 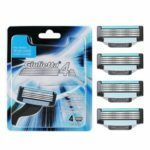 Made of imported steel material, precise 4-layer blades give a closer shave, comfortable and long lasting. Lubricating strip is great to reduce skin irritation, protects your skin from redness. 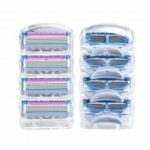 Enjoy complete shaving experience that you never imagine before! 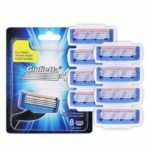 4pcs razor blade refills in one pack, each blade refill with four-layer blades. 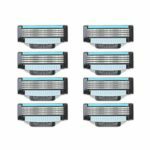 Made of imported steel material, precise 4-layer blades give a closer shave, comfortable and long lasting. Advanced skin guard helps stretch your skin, and prepares your hair to be cut. Vitamin E lubricating strip protects your skin from redness, fades away when you are no longer getting an optimal shave. The completely open blade architecture is designed for better rinsing and less bacteria. It is compatible with all 4-blade handles and Mach 3 razor handle and also compatible for Giulietta 3-layer razor.